One of essential things to control is lighting. You don’t leave this part unchecked. It doesn’t matter if you have great ISO performance, if you don’t have enough lighting, you don’t get the video. Even if you try, you’ll get dirty, smudgy results. Thus I’d prefer to have some sort of lighting control in my bag. Since I’m now doing video, I need continuous lighting. I would prefer the LED lights compared to any plug in, bulb-sourced lighting. I'm going to use it for weddings, interviews and MTV's. I want them to be small and powerful. I don’t want to be plugged into a wall socket. I want to be mobile! I want lights that doesn't give off too much heat but are bright. I think this sums up to be LED lights. Some batteries could give you up to 4 hours of service, so that’s good enough for me to do the things I needed to accomplish. 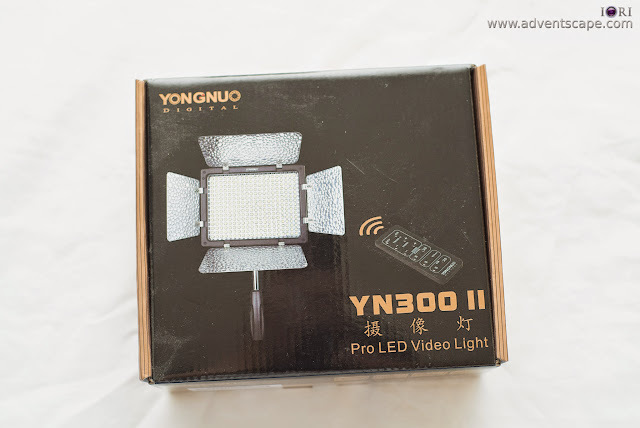 At this point, I was looking at Yongnuo LED Lights: YN-160 II, YN-300 II and YN-600. As I was looking at YN-160 II, it's small and fits perfectly on a hot shoe. It's lighter than your speedlight thus you don't worry about added weight on your dSLR. It comes with a good set of accessories. I love that it takes 6 x AA batteries (may not be as long lasting as FP batteries but it's a good addition). It has all the needed controls for this lighting. Although it has all those advantages, I think it’s too small for my purposes. It does give off light, but before you achieve that degree of lighting, you're always at full power (or near it’s subject). I'm not sure if it has ample power to light up a guest's table in a reception. 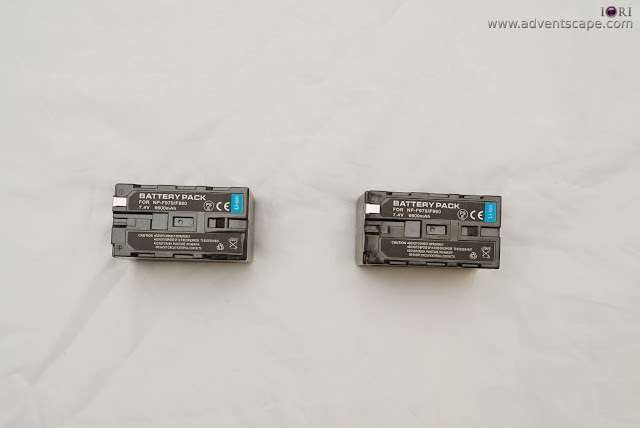 The Yongnuo YN-300 II has all the advantages of the YN-160 II except that it doesn't take AA batteries. Understandable as AA's may not be enough for this LED lighting. But the YN-300 II is twice as powerful as YN-160 II. 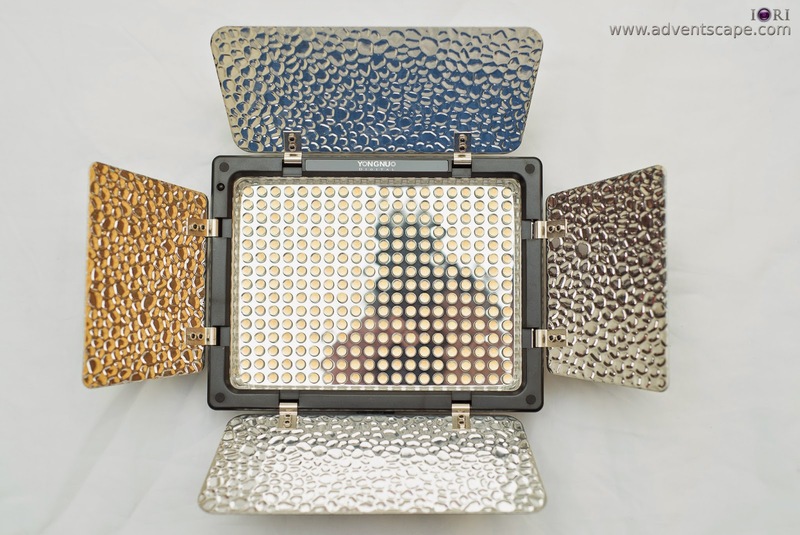 I felt that this is the minimum LED lighting that I need for weddings ceremony and reception. This is a good contender. I love the Yongnuo YN-600. It's twice the power of a YN-300 II. This will give you more leg room when lighting a dining table on a reception. But the cost racks up pretty quickly. Since I'm on a budget, I decided to skip this one at the moment and just buy this for my next filming. So I decided to go YN-300 II LED lighting. The price point of YN-300 II is friendly as well. If you needed 2 lights, you won't hold back buying these. I didn't use the CT filters. Probably it's just personal preference or the lack of knowledge in creative lighting. I love the hot shoe fastening knob. You can mount this on your dSLR via hot shoe and lock it in place by tightening the knob. 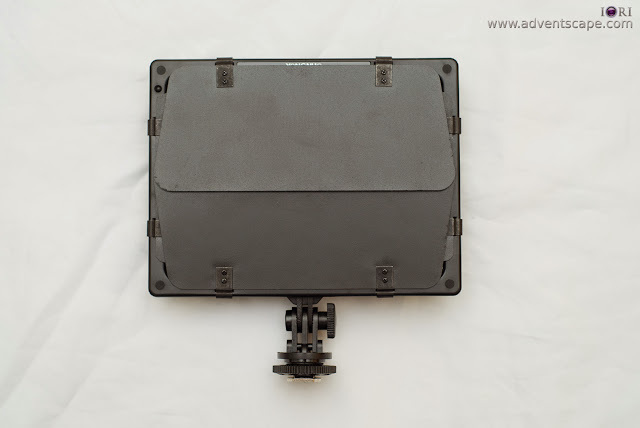 The metal hot shoe itself has a 1/4" hole to screw in a quick release plate or a lightstand. It also has an adjustable joint. So if you mount this on a lightstand you can adjust this joint to tilt the YN-300 II up or down. The pouch is a good addition to bring along all needed accessories. This includes the batteries, remote and CT filters. I've already used this product twice and it doesn't disappoint. I never used it at full power yet for the 2 shoots that I did. My batteries are rated 3-4 hours and that's what this LED lighting is designed for. It doesn't eat too much power - which is nice! I managed to light up a whole table of guests during a reception. This gave me the chance to lower my ISO and lower the noise on my video. I would love the YN-600, but at the moment, this is enough. 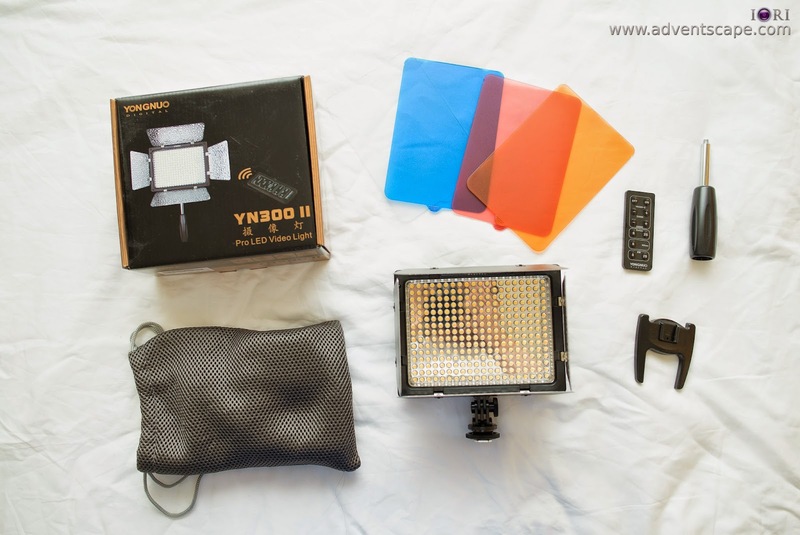 Once I felt that I needed more lights, then I'll buy the YN-600. It's very light to mount it on the hot shoe of your camera. I was using a Sony A7s and I didn't have trouble holding it even with YN-300 II attached. It's very easy to control. I haven't used the remote because it's always mounted on the camera. But probably if I'll hang this on something (or it's impractical to adjust on the fly), then I'll consider the remote. I haven't used the CT filters. They are a good addition for those who are very creative in lighting. But for me, bringing down the Dynamic Range or lighting the shadows a bit is already enough. 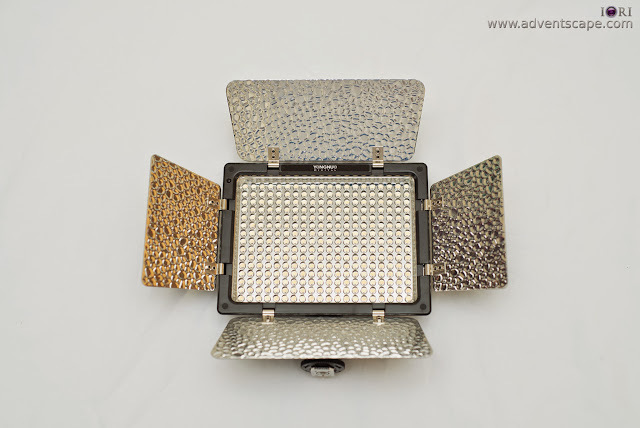 Although with limited experience on the product, I can see that I'll be using this when I need lighting. It can easily be packed in the bag and doesn't make your dSLR any heavier. The accessories add great value to the already low price point. This is a good starting light. Once I used it enough, then I can make my own review of this product. But from what I've used it for, it's fitting for my needs.